Dr. Babs Waldman and Avi Shaked '80 meet scholarship recipient Tim Hennessey (center). University of Wisconsin-Milwaukee alumnus and former scholarship recipient Avi Shaked, along with his wife, Babs Waldman, MD, has given the university $2 million for scholarships in the College of Engineering & Applied Science and for the Lubar Entrepreneurship Center. This gift brings the couple’s total giving to UWM to $4 million. Shaked came to UWM in 1977 from Israel and had to quickly learn English. He enrolled in engineering classes. After his first semester, a friend suggested he apply for a scholarship – something Shaked knew nothing about. He applied and, because of his good grades, received a full-ride scholarship that enabled him to focus solely on his classes without having to hold a job while he went to school. Because he had more time to study, he took the maximum number of credits (21) per semester, graduating in 1980 from the electrical engineering and pre-dental programs. Shaked began his career working for Milwaukee entrepreneur and philanthropist Nate Zelazo at Astronautics Corporation of America before becoming a computer design engineer at IBM. After just a few years, he launched his own company called Onward Technologies, which provides IT services and custom software development to corporations. Waldman says philanthropy is in her DNA. A physician and assistant professor of Internal Medicine at Rush University Medical College and Northwestern University Medical School, she serves as the volunteer medical director of the largest free clinic in the United States and is active in community development and medical work in Haiti and the Dominican Republic. Shaked and Waldman gave their first million-dollar gift to UWM in 2005 and their second million in 2011 – all for scholarships. UWM was so excited with the impact of the scholarship program on the engineering school that the school decided to match dollar for dollar and expand the program. Thus, their giving launched the Engineering Excellence Scholarship Program, which provides four-year renewable scholarships at the College of Engineering & Applied Science. Since 2006, the couple has helped over 550 undergraduate engineering students at UWM. These scholarships are based on merit, such as grade point average, class rankings and test scores. For many students, the Shaked Waldman Scholarship was the deciding factor in choosing UWM over other universities. In addition to being a powerful recruiting tool, the Shaked Waldman Scholarships have helped raise the caliber of engineering students at UWM. In the 11 years the scholarship has been awarded, the average GPA has risen from 3.19 to 3.42; the retention rate of freshman students in the College of Engineering & Applied Science went from 73.5 percent to 80 percent; and enrollment has increased 24 percent. Half of the couple’s recent $2 million gift will support engineering scholarships, while the other million is earmarked for the Lubar Entrepreneurship Center. As an entrepreneur himself, Shaked sees the value in exposing students to innovative thinking and problem solving. Shaked says he feels wonderful whenever he is reminded of the impact his giving has made at UWM. Avi Shaked’s and Babs Waldman’s gift supports UWM’s comprehensive fundraising effort, Made in Milwaukee, Shaping the World: The Campaign for UWM. Focused on raising support for students, research and community engagement, the campaign has a goal of $200 million, the largest in UWM’s history. 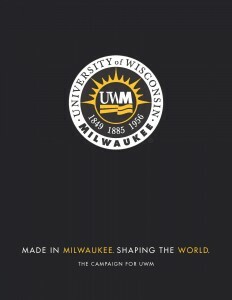 What Does UWM Mean to You?